I have this thing for dark chocolate. The more cocoa in it, the better, which is why I cannot abide by milk or white chocolate. They're far too sweet for my palate and usually toothache inducing. And my love for everything French drives my constant search for good French home cuisine recipes (tomato and hard boiled egg salad is my favorite). 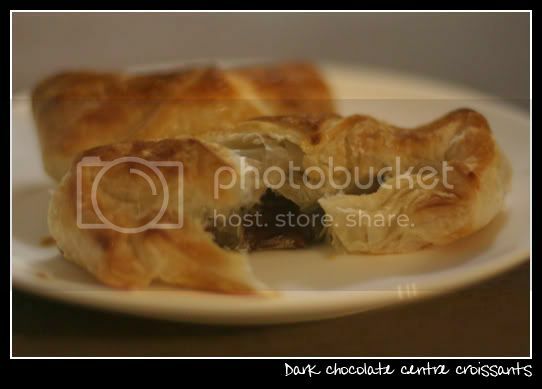 So when I found this awesome ilttle recipe to make mini dark chocolate croissants, I had to give it a go. It only takes 3 ingredients and the result made my knees weak. The puff pastry will usually come in large square sheets of about 30cm x 30cm. Cut each sheet diagonally to make 4 triangles. Break the bar of chocolate into shorter rows and place 1 short row on the longest side of a puff pastry triangle. Roll the pastry and chocolate towards the triangle tip, sealing it with a touch of water if needed and tuck in the ends underneath. Brush the pastry lightly with the egg. Bake in a 200 deg C (392 deg F) for 15 mins or until golden brown in a well-greased baking tray. And if you're feeling particularly fancy, melt a little chocolate over a boiling pot of water and drizzle some over the top of each mini croissant. You really can't get any simpler than this and to be honest, this looks a lot more impressive than the amount of work that goes into making them. I can't think of a simpler to dessert to serve if you can't be arsed to slave days in the kitchen.